As a typical Chinese herbal medicine, rhizoma Cimicifugae (RC, 升麻 in Chinese) possesses various pharmacological effects involved in antioxidant activity. However, its antioxidant activity has not been reported so far. The aim of the present study was to systematically evaluate the antioxidant ability of RC in vitro, then discuss the mechanism. Firstly, five RC extracts (i.e. petroleum ether extract PERC, ethyl acetate extract EARC, absolute ethanol extract AERC, 95% ethanol extract 95ERC, and water extract WRC) were prepared and determined by various antioxidant methods, including anti-lipidperoxidation, protection against DNA damage, ·OH scavenging, ·O2- scavenging, DPPH· (1,1-diphenyl-2-picryl-hydrazl radical) scavenging, ABTS+· (2,2’-azino-bis (3-ethylbenzo- thiazoline-6-sulfonic acid radical ion) scavenging, Cu2+-chelating, and Fe3+ reducing assays. Subsequently, we measured the chemical contents of five RC extracts, including total phenolics, total saponins, total sugars, caffeic acid, ferulic acid and isoferulic acid. Finally, we quantitatively analyzed the correlations between antioxidant levels (1/IC50 values) and chemical contents. In the study, the antioxidant levels and chemical contents (including total phenolics, total saponins, total sugars, caffeic acid, ferulic acid and isoferulic acid) of five RC extracts were determined by various methods. In all antioxidant assays, five RC extracts increased the antioxidant levels in a dose-dependent manner. However, their antioxidant levels (IC50 values) and chemical contents significantly differed from each other. Quantitative analysis of the correlation showed that total phenolic was of significant positive correlations (average R value was 0.56) with antioxidant levels; In contrast, total sugars and total saponins had no positive correlation with antioxidant (the average R values were −0.20 and −0.26, for total sugars and total saponins, respectively); Among total phenolics, three phenolic acids (caffeic acid, ferulic acid and isoferulic acid) also displayed positive correlations (the average R values were 0.51, 0.50, and 0.51, for caffeic acid, ferulic acid and isoferulic acid, respectively). As an effective antioxidant, Rhizoma Cimicifugae can protect DNA and lipids against oxidative damage. Its antioxidant ability can be responsible for its various pharmacological effects and may be mainly attributed to the existence of total phenolics, among which caffeic acid, ferulic acid and isoferulic acid are regarded as main bioactive components. Rhizoma Cimicifugae exerts its antioxidant effect through metal-chelating, and radical-scavenging which is via donating hydrogen atom (H·) and donating electron (e). As we know, reactive oxygen species (ROS) are various forms of activated oxygen including free radicals and non-free-radical species. ROS can oxidatively damage vital cellular structures such as lipids and DNA [1, 2], then lead to severe biological consequences including mutation, cell death, carcinogenesis, and aging . Therefore, it is important to search for potential therapeutic agents for oxidative damage. In recent years, medicinal plants especially Chinese medicinal herbals have attracted much attention. As a typical Chinese herbal medicine, rhizoma Cimicifugae (RC, 升麻 in Chinese, the photo is shown in Additional file 1) has been used for over 2000 years . From the viewpoint of tradition Chinese medicine (TCM),RC can elevate yang, lift qi, clear heat, remove toxic, induce sweats to dispel exopathogens, and promote eruption . Modern medicine indicated that RC possessed various pharmacological effects. Ye reported that RC possessed antidepressant-like properties in rodents ; Kim pointed out that RC can treat pain and inflammation ; An isopropanolic extract of RC, however, was proved to be able to diminish the urinary content of PYR and DPY and the morphometric correlates of bone loss associated with ovariectomy in rats ; The supply of RC can therefore prevent OVX-induced bone loss in mice . In addition, the extract of RC was found to have protective effect against gastric injury . According to free radical biology & medicine , these pharmacological effects are related to antioxidant ability. However, its antioxidant ability has not been explored so far. Therefore, the aim of the study was to investigate the antioxidant ability of RC in vitro, then further discuss the antioxidant mechanism. In our study, five RC extracts increased the anti-lipidperoxidation percentages in a dose-dependent manner (Additional file 2). It means that five RC extracts can effectively protect lipid against oxidative damage. Among them, EARC possessed the highest anti-lipidperoxidation activity (Table 1). IC50 value is defined as the concentration of 50% effect percentage and calculated by linear regression analysis and expressed as mean ± SD (n = 3). The linear regression was analyzed by Origin 6.0 professional software. Means values with different superscripts in the same row are significantly different (p < 0.05), while with same superscripts are not significantly different (p < 0.05). *The positive control was BHA, instead of GSH. ** The positive control was Trolox, instead of GSH. *** The positive control was Sodium citrate. Results were analyzed by independent samples. PERC, petroleum ether extract of rhizoma Cimicifugae; EARC, ethyl acetate extract of rhizoma Cimicifugae; AERC, absolute ethanol extract of rhizoma Cimicifugae; 95ERC, 95% ethanol extract of rhizoma Cimicifugae; WRC, water extract of rhizoma Cimicifugae. --: Cannot be detected. Besides lipid, another biomolecule DNA can also be oxidatively damaged by ROS (especially ·OH). It is well known that DNA consists of deoxyribose, organic phosphate and various base pairs. When DNA is attacked by ·OH radical, MDA (malondialdehyde) and a number of oxidative lesions are generated . MDA combines with 2-thiobarbituric acid (TBA) to produce thiobarbituric acid-reactive substances (TBARS) with λmax at 530 nm (Scheme 1). The reaction of MDA (malondialdehyde) and 2-thiobarbituric acid (TBA). Therefore, the A532nm value is proportional to the produced amount of ·OH radicals. Higher A532nm values indicate higher levels of ·OH radicals. If an antioxidant sample is added, the A532nm value will decrease, suggesting that some ·OH radicals are scavenged and the hydroxyl-induced DNA damage are protected by the antioxidant. Among five RC extracts, 95ERC and EARC were proved to be of protective effect against hydroxyl-induced DNA damage (Table 1 and Additional file 2). Previous studies have shown that there are two approaches for natural phenolic antioxidant to protect DNA oxidative damage: one is to scavenge the ·OH radicals then to reduce its attack; one is to fast repair the deoxynucleotide radical cations resulting from ·OH radicals attack . In order to further confirm whether the protective effect against DNA oxidative damage was relevant to radical-scavenging ability, the ·OH and ·O2- radical-scavenging abilities of five RC extracts was determined in vitro. As we know, ·OH radical in body is produced by Fenton reaction (Equation 4). However, our data suggested that five RC extracts can effectively scavenge ·OH radicals (Table 1 and Additional file 2). Besides ·OH radical, superoxide anion radical (·O2-) is also regarded as one important form of ROS in living cell. It can directly attack DNA or lipid , and can transferred into ·OH via Haber-Weiss reaction (Equation 5) to indirectly damage DNA or lipid as well . The results in Table 1 and Additional file 2 showed that five RC extracts could also scavenge ·O2- radicals. Taken together, the protective effect of RC against hydroxyl-induced DNA oxidative damage can be assumed to be relevant to the ·OH or ·O2- radical-scavenging ability. However, as illustrated in Equations 4 and 5, the generations of ·OH and ·O2- radicals rely usually on the catalysis of transition metals (especially Fe and Cu). So we further explored the metal chelating abilities of five RC extracts. The dose–response curves showed that five RC extracts possessed effective metal chelating abilities (Additional file 2). Our previous reports have shown that the chelating ability might be mainly attributed to ortho dihydroxyl groups in phenolic compounds . For example, phenolic acids can bind Fe2+ as the following mechanism (Scheme 2) . The proposal reaction of phenolic acids binding Fe 2+ . The fact that five RC extracts can effectively bind Fe2+ ion, suggests that metal-chelating may be one of mechanisms for scavenging ·OH or ·O2-. In order to verify whether five RC extracts can directly scavenge radicals. We determined their DPPH· and ABTS·+ radical-scavenging abilities. As seen in Table 1 and Additional file 2, five RC extracts scavenged both DPPH· and ABTS·+ radicals in a dose-dependent manner. The previous studies have demonstrated that DPPH · may be scavenged by an antioxidant through donation of hydrogen atom (H·) to form a stable DPPH-H molecule [16–18]. Caffeic acid, a phenolic acid occurring in RC, for example, could scavenge DPPH· via the proposed reaction (Scheme 3) . The proposal reaction of caffeic acid to scavenge DPPH· (step 1). Radical (A) can be further withdrawn hydrogen atom (H·) to form stable quinone (B) (Scheme 4). The proposal reaction of caffeic acid to scavenge DPPH· (step 2). Unlike DPPH· scavenging, ABTS ·+ scavenging however is considered as an electron (e) transfer reaction . For example, the proposed reaction for caffeic acid to scavenge ABTS ·+ can be briefly illustrated using Scheme 5. Similarly, if ABTS ·+ is excessive, radical (A) can also further change to quinone (B). The proposal reaction of caffeic acid and ABTS · + . As illustrated in Scheme 3, 4 and 5, the generations of both DPPH· and ABTS·+radicals did not rely on the transition metal catalysis. Based on the discussion above, it can be deduced that direct radical-scavenging was regarded as another mechanism for five RC extract to scavenge ·OH or ·O2-, and they exerted radical-scavenging action by donating hydrogen atom (H·) and electron (e). Until now, about 200 compounds have been found in RC . Generally, they belong to three different classes, i.e. phenolics, saponins, and polysaccharides. In the study, we used chemical method to measure the contents of total phenolics, total saponins, and total sugars in fiver RC extracts (Table 2). On the other hand, since 1/IC50 value showed parallelism with antioxidant level, it was therefore used to evaluate antioxidant level in the study (Additional file 2). On this basis, forty-eight correlation graphs were plotted to quantitative analyze the correlation between antioxidant levels and chemical contents in five RC extracts (Additional file 3). The correlation coefficients (R values) in Table 3 indicated that, total phenolics were of significant positive correlations (R = 0.17 ~ 0.99; average, 0.56) with antioxidant levels, while total sugars and total saponins had no positive correlations (for total sugars, R = −0.88 ~ 0.46, the average was −0.20; for total saponins, R = −0.92 ~ 0.94, the average was −0.26) with antioxidant levels. The data clearly demonstrated the significant contribution of phenolic compounds to the antioxidant of RC. Each value is expressed as mean ± SD (n = 3). Means values with different superscripts in the same row are significantly different (p < 0.05), while with same superscripts are not signifiacntly different (p > 0.05). PERC, petroleum ether extract of rhizoma Cimicifugae; EARC, ethyl acetate extract of rhizoma Cimicifugae; AERC, absolute ethanol extract of rhizoma Cimicifugae; 95ERC, 95% ethanol extract of rhizoma Cimicifugae; WRC, water extract of rhizoma Cimicifugae. --: Below the detection limit. Pyr., pyrogallo; Ole., Oleanic acid. R, correlation coefficient; 1/IC50: the unit is mL/μg, all 1/IC50 values are listed in Additional file 2. LPO, lipid peroxidation. Among total phenolics, several compounds had been isolated from RC, including salicylic acid, caffeic acid, ferulic acid, isoferulic acid, flavonoids and tannins. 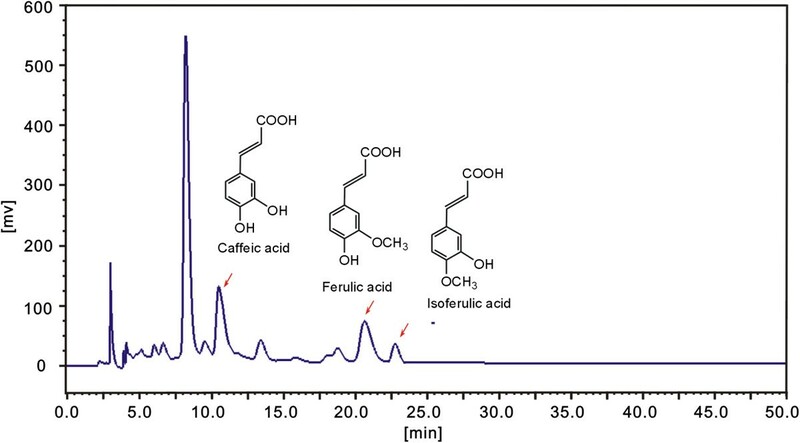 In our study, however, three phenolic acids caffeic acid, ferulic acid and isoferulic acid were also identified by HPLC assay (Figure 1 and Additional file 4), in which peak areas were used to characterize the relative contents of three phenolic acids. A typical HPLC profile of EARC (ethyl acetate extract of rhizoma Cimicifugae ). Syltech P510 HPLC system (Los Angeles, California, USA), Dikma Diamonsil C18 (250 mm × 4.6 mm, 5 μm size) (Beijing, China), acetonitrile-0.5% acetic acid in water (17:83, v: v), 1.0 mL/min flow rate, 30 μL injection, 316 nm wavelength. Then, we used the peak areas to plot the correlation graphs vs 1/IC50 values of five RC extracts, to obtain the correlation coefficients (R values). As shown in Additional file 5 and Table 3, three phenolic acids all presented significant positive correlations (average R value = 0.47, 0.44, and 0.51, respectively for caffeic acid, ferulic acid and isoferulic acid). On the other hand, previous works have shown that three phenolic acids possess strong antioxidant ability [22–24]. Hence, they are considered as three of main bioactive compounds relevant to antioxidant in RC. Trolox (± − 6-hydroxyl-2,5,7,8-tetramethlyhromane-2-carboxylic acid), Ferrozin [3-(2-pyridyl)-5,6-bis (4-phenylsulfonicacid)-1,2,4-triazine], DPPH · (1,1-Diphenyl-2-picrylhydrazyl radical), pyrogallol, linoleic acid, BHT (2.6-ditertiary butyl-p-cresol) and murexide (5,5′-Nitrilodibarbituric acid monoammonium salt) were purchased from Sigma Co. (Sigmaaldrich Trading Co., Shanghai, China); ABTS diammonium salt [2,2′-Azino-bis (3-ethylbenzothiazoline-6-sulfonic acid diammonium salt)], D-2-deoxyribose, and GSH (glutathione) were Amresco Inc. (Solon, OH, USA); DNA sodium salt (fish sperm) was purchased from Aladdin Chemistry Co. (Shanghai, China); Ferulic acid, caffeic acid were purchased from National Institute for the Control of Pharmaceutical and Biological Products (Beijing, China); Acetonitrile, methanol and water were of HPLC grade; All other chemicals used were in analytical grade. Rhizoma Cimicifugae was purchased from Guangzhou University of Chinese Medicine Yanghe Interlink Limited Company and identified by Prof. Shuhui Tan. A voucher specimen was deposited in our laboratory. 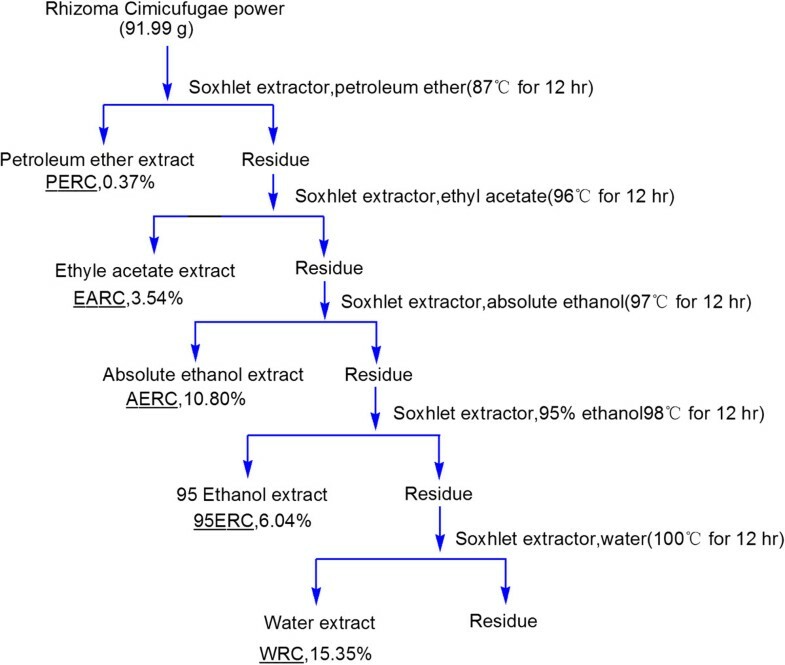 The dried rhizoma Cimicifugae was coarsely powder then extracted in sequence with petroleum ether (60–90), ethyl acetate, ethanol, 95% ethanol and water by Soxhlet extractor for 12 hours. The extracts were concentrated under reduced pressure to a constant weight. Then the dried extracts were stored at 4°C until used (Figure 2). Preparation of five extracts of rhizoma Cimicifugae. Where A is the absorbance with samples, while A 0 is the absorbance without samples. Where A is the absorbance containing samples, while A 0 is the absorbance without samples. Here, ΔA 325nm, control is the increase in A 325nm of the mixture without the sample and ΔA 325nm, sample is that for the mixture with the sample; T = 5 min. The experiment temperature was 37°C. Where A 485 A 520 is the absorbance ratio of the sample, while A 485 A 520 max is the maximum absorbance ratio and A 485 A 520 min is the minimum absorbance ratio in the test. Where A 0 is the absorbance without samples, while A is the absorbance with samples. Where A 0 is the absorbance at 734 nm without samples, while A is the absorbance at 734 nm with samples. Ferric cyanide (Fe3+) reducing power was determined according to the method of Oyaizu [23, 29]. In brief, sample solutions x μL (4 mg/mL, x = 20, 40, 60, 80, and 100) were mixed with (350-x) μL Na2HPO4/KH2PO4 buffer (0.2 M, pH 6.6) and 250 μL K3Fe(CN)6 aqueous solution (1 g/100 mL). Here, A max is the maximum absorbance and A min is the minimum absorbance in the test. A is the absorbance of sample. Caffeic acid, ferulic acid, and isoferulic acid were identified by comparing their retention times using HPLC method. HPLC analysis was performed on a Syltech P510 system (Los Angeles, California, USA) equipped with Dikma Diamonsil C18 (250 mm × 4.6 mm, 5 μm) (Beijing, China). The mobile phase consisted of acetonitrile-0.5% acetic acid in water (17:83, v: v), the flow rate was 1.0 mL/min, injection volume was 30 μL and absorption was measured at 316 nm. The total phenolics of five RC extracts were determined by the Folin-Ciocalteu method with a little modifications . Firstly, 0.5 mL extract methanolic solution ( 0.4 mg/mL ) was mixed with 0.5 mL 0.25 M Folin-Ciocalteu reagent. After incubation for 3 min, 1 mL of Na2CO3 solution (15%, w/v) was added. After standing at the room temperature for 30 min, the mixture was centrifuged at 3500 r/min for 3 min. The absorbance of the supernatant was measured at 760 nm (Unico 2100, Shanghai, China). The determinations were performed in triplicate, and the calculations were based on a calibration curve obtained with pyrogallol. The result was expressed as pyrogallol equivalents (Pyr.) in milligrams per gram of extract. The total sugars were evaluated according to the phenol-sulfuric acid method . A 40-μL aliquot of sample solution (1 mg/mL) was placed in a flask, then 210 μL distilled water, 250 μL phenol solution (5%, w/v) and 250 μL concentrated sulfuric acid were added. After incubation for 20 min at room temperature, the absorbance of reaction mixture was measured at 490 nm (Unico 2100, Shanghai, China). The measurements were performed in triplicate, and the calculations were based on a calibration curve obtained with glucose. The result was expressed as glucose equivalents in milligrams per gram of extract. The total saponins were measured according to the method . RC extract was dissolved in methanol to prepare the sample solution (4 mg/mL), then a 20-μL aliquot of sample solution was taken into a mini tube. After the sample solution in tube was evaporated to dryness (water bath, 80°C), 0.1 mL vanillin-acetic acid solution (5 mg/mL) and 0.4 mL perchloric acid were added to the sample residue. The reaction mixture was incubated at 70°C for 15 min, then diluted by 1.25 mL acetic acid. The mixture was measured using a spectrophotometer (Unico 2100, Shanghai, China) at 540 nm against a blank control, which contained all reagents except sample. All analyses were run in triplicate. Quantification was based on the standard curve for oleanic acid (10–79 μg/mL) and the results were expressed in milligrams of oleanic acid (Ole.) equivalents per gram of extract. In order to investigate the correlation between antioxidant activities and chemical components of five RC extracts, 48 correlation graphs were plotted between 1/IC50 values (including of LPO, DNA, ·OH, ·O2- ,Cu-chelating, DPPH·, ABTS·+, and reducing power assays) and chemical contents (including total phenolics, caffeic acid, ferulic acid, isoferulic acid, total sugars, and total saponins). In the correlation graphs, the correlation coefficients (R values) were calculated by Origin 6.0 professional software. Data are given as the mean ± SD of three measurements. The IC50 values were calculated by linear regression analysis. All linear regression in this paper was analyzed by Origin 6.0 professional software. Significant differences were performed using the T-test (p < 0.05). The analysis was performed using SPSS software (v.12, SPSS, USA). Xican Li, Jing Lin contributed equally to this work. This work was supported by the National Nature Science Foundation of China (81273896) and National Key Technologies R&D Program of China (No. 2008BAI51B01). XL & JL made a significant contribution to experiment design, acquisition of data, analysis, drafting of the manuscript. YG and WH have made a substantial contribution to interpretation of data, drafting. DC has carefully revised the manuscript for intellectual content. All authors read and approved the final manuscript.